In listening to the needs of tradesmen, C.K Magma, the range of premium storage and personal protective equipment (PPE), from C.K tools, has revamped its range of tool-belts and accessories, offering tradesmen more streamlined tool storage solutions. With the physically demanding nature of a tradesman’s job, bulky tool-belts can often restrict movement and hinder access to confined spaces. In addressing this, C.K Magma has redeveloped its premium quality range of tool-belts, pouches and holders, making them far slimmer, delivering even greater comfort, flexibility and longer lasting performance than ever before. The new and improved slimline range comprises a Knife Holder, Tape Measure Holder and a Nail Pouch, which all fit onto a new C.K Magma Compact Padded Work Belt. All are constructed from durable 600-denier polyester for extra strength and longevity. As with all new C.K product introductions, innovative features are as standard, setting the C.K Magma accessories range apart from the competition. 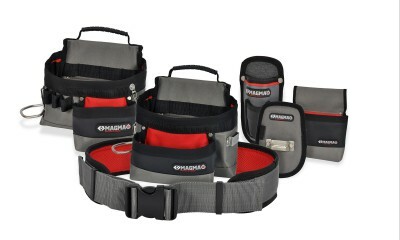 For maximum comfort and security, the fully adjustable C.K Magma Work Belt features extra padding, along with a quick release mechanism for speed and ease, whilst a plastic cut proof interior on the Knife Holder offers premium protection and features a convenient front pocket ideal for storing extra blades. As Laurel is to his Hardy, a tape measure is never without a pen – with this in mind the new C.K Magma Tape Measure Holder benefits from a handy pen holder, whilst the enhanced Nail Pouch features a large, easy access mouth for speed and convenience. C.K Magma remains committed to continuously improving products in line with the changing needs of tradesmen. Following feedback from its panel of professional end users, the C.K Magma Electrician’s and Builder’s Tool Pouches have undergone remodelling in terms of pocket arrangement. New features include ‘easy-to-grab’ holders for pliers and cutters, smaller pockets for cable ties, a cut proof reinforced knife pocket and a unique hammer loop removable system offering flexibility to use it on the left or right hand side. Vanessa Troupel, deputy brand manager C.K Magma said: “We work closely with end-users to find out exactly what they want and need from their tools and products. Listening to feedback has given C.K Magma an in-depth understanding of the very nature of the work tradesmen undertake and the issues and restraints relating to that work. This knowledge has steered the company to further improve the popular tool-belts and pouches, while also introducing some interesting new accessories to the range.